Kirjeldus G4 UMA i5-8250U 15.6inch FHD AG 16GB 512GB PCIe NVMe TLC SSD W10P DVD+-RW AC BT Active SmartCard FPR No NFC 3y war. HP ProBook 650 G4 UMA i5-8250U 15.6inch FHD AG 16GB 512GB PCIe NVMe TLC SSD W10P DVD+-RW AC BT Active SmartCard FPR No NFC 3y war. 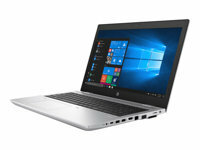 The modern slim design of the HP ProBook 650 delivers enterprise-grade performance, security, and manageability while working with today's technology and continuing to support connectivity to legacy devices. Ideal for professionals in corporate settings or small to medium businesses, wanting an affordable combination of innovation, essential security and multimedia capabilities.